Inter Aide (and BASEDA) have been notably and highly consulted for the development of the series concerning these two last points (AM and supply chain). Lot of tools, illustrations have been selected trough the example and experiences of Inter Aide. No doubt that inter Aide (and BASEDA) approaches are in direct link with these national guidelines. This entry was posted in WaSH institutions and policies on 9th March 2016 by mathieu. The Council is supposed to be headed by the Chairperson selected from amongst its 10 councilors each representing a ward in the district. The District Commissioner is the head of Council Secretariat, which is composed of Professional Heads of Government Sectors in the district. The council must have the following service committees: Finance Committee; Development Committee; Education Committee; Works Committee, Appointment and Disciplinary Committee Health and Environment Committee which is the custodian committee on water and sanitation issues. It may establish other committees when need arises. This is a technical body that provides advice to the Council and its service committees. It is composed of all Heads of Departments and NGO/Development partners in the district. The District Executive has a membership of 50, chaired by the District Commissioner while the Director of Planning and Development is its secretary. The DEC has a subcommittee of District Coordinating Team (DCT) on water, sanitation and hygiene. Membership of the committee consists of both the sector heads and non-state actors involved in water, sanitation and hygiene. The committee is chaired by the Director of Planning and Development with secretariat for sanitation in Health Sector. The main role of the DCT is coordination of water, sanitation and hygiene activities in the district. The Area Development Committee (ADC) is a representative body of all Village Development Committees under a Traditional Authority. Its membership could range from 25 to 60 under the patronage of the Chief. It mobilizes community resources and implements development interventions within it’s the area. Membership includes Group Village Headpersons, Representative of Women Groups, and representative of Youth Groups, the District Councilors of the area, and Business and Religious Leaders. The district follows a decentralized approach in implementing all projects in the district, water and sanitation inclusive. It is the role of the ADC to prioritize the demand driven WASH projects from all village development committee’s in a traditional authority. The ADC also assists in the identification an overall project that cuts across the ADC i.e. piped water systems and mobilization of resources during the course of implementation of a project. An Area Executive Committee is composed of Extension workers of Government and Non-Governmental Organizations (NGOs) operating in the Traditional Area. At the area level Government extension workers in the WASH sector are the Health surveillance assistance and water monitoring assistant. This committee is the technical arm at the area level responsible for advising the ADCs on all aspects of development. This entry was posted in WaSH institutions and policies on 28th August 2015 by mathieu. 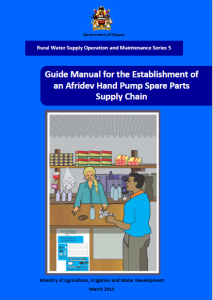 The Water Supply and Sanitation Department oversees formulation of sector policies, sets technical standards and procedures for the provision of services; plans, designs the construction of water supply schemes; and trains communities in proper management of water supply schemes. The Ministry of Health is responsible quite separately for sanitation, as well as for hygiene education. Integration of work in these areas is therefore a major challenge. Water Boards: are in charge of urban water supply. At district level, The Water Department headed by the District Water Officer is the entity giving the direction and strategies for development of water access. It is evaluating where the needs and the priorities are, deciding of new infrastructures. 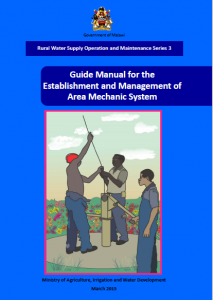 WMAs (Water Monitoring Assistants) are in charge to train and monitor Water Point Committees. Inter Aide, BASEDA and TIMMS are collaborating with them for the supervision of the activities of Area Mechanics (the idea is to progressively organize a transfer of competencies). 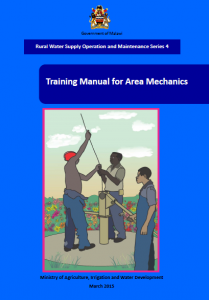 BMOs (Borehole Maintenance Overseer) – a position which does not exist in all districts – are in charge of managing construction of boreholes and major rehabilitation. They are also supervising and giving support to campaigns leaded by other operators (NGOs…). They can advise Area Mechanics for the repairs.